The current statistics around mental health show that 1 in 4 people in the UK will experience a mental health problem each year (mind.org). Mental health issues are an increasing concern not only within adults but also children and young people. The last national morbidity survey completed for children and young people was in 2004, which found that 1 in 10 children aged between 5 and 16 were reported as having a clinically diagnosed mental health disorder. In 2013/2014 there were 51,000 referrals of 15 – 19 year olds to psychological therapies (NHS, March 2016). This demonstrates an increasing trend in issues around mental health for young people. Poor mental health and low emotional wellbeing has been identified as a common concern that is affecting young people within our E-ACT academies. To support our children and young people E-ACT have trained ten members of staff to be trained instructors of Youth Mental Health First Aid. This has enabled the instructors to go into the academies and train academy staff as Youth Mental Health First Aiders. This will enable them to provide information, tools and techniques to promote a young person’s mental and emotional wellbeing and support a young person who might be experiencing mental and emotional distress. Training for academy staff started in September 2017. As a result, E-ACT (North) has currently 80 members of staff fully trained as ‘Mental Health First Aiders’. The training will continued to rolled out every term for all staff who work with children. In the UK, there is an estimated 4.6 million people in work who may have a common mental health problem. That equates to 1 in 6.8 employed people experiencing mental health problems in the workplace (OECD, 2013). Between one in five and one in six working age adults is depressed, anxious or experiencing stress-related problems at any one time (MHFA, 2016). In 2013 the Chief Medical Officer estimates that around 70 million working days are lost every year because of mental ill health, costing Britain between £70bn and £100bn. Everybody experiences mental health, however mental health and wellbeing (Being comfortable, healthy or happy) sits along a continuum which we all move along and up and down. The impact that mental health and wellbeing has on employees is a significant concern that E-ACT is very aware of. By partaking in the Adult MHFA training E-ACT are seeking to create a climate where people feel confident to talk openly about the problems they are experiencing and trust their employer to do the right thing by them. 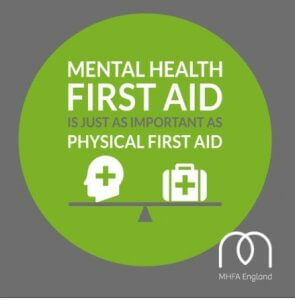 E-ACT have trained 5 members of staff to become Adult Mental Health First Aid Instructors who are able to train key members of staff in each academy in Adult MHFA.